Last year Rick and I returned to Barcelona. Rick had been there fifty years ago; for me it was 43 years. The changes were astonishing--we were returning to a different city. This year we returned to Madrid. We had been there together in 1986 when Spain was just emerging form the dark night of the Franco regime. The changes may not have been as dramatic as what we experienced in Barcelona, but they were striking nonetheless. 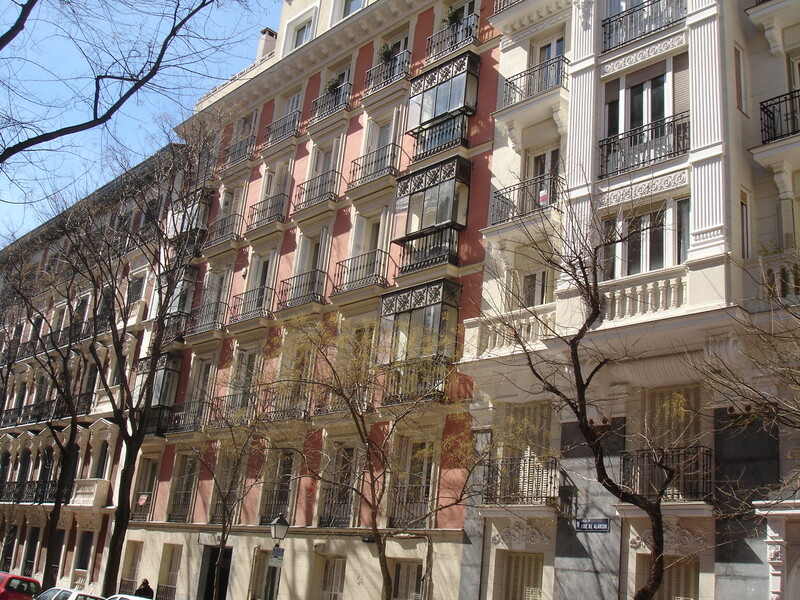 The somewhat shabby down-at-heels historic center of the Madrid of 1986 was transformed into sparkling vibrant city with its architectural treasures beautifully restored. 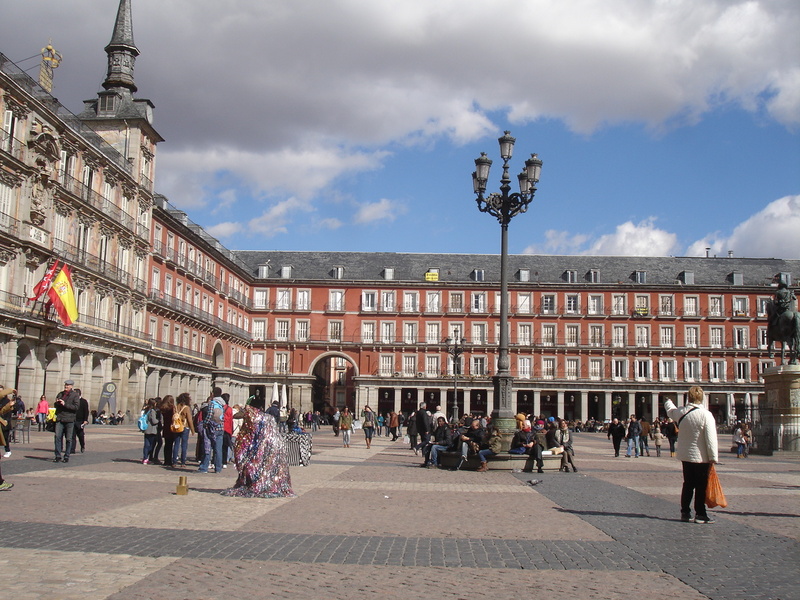 Although Spain is mired in recession, you would ever know from a visit to the historic part of Madrid. 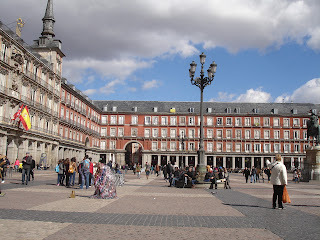 When we visited in 1986, I was overwhelmed by the Prado and the beauty of the Plaza Mayor but for the most part wasn’t particularly impressed by Madrid. That has changed. Madrid is definitely on my list of places I would like to see again. Unfortunately, since we don’t have an endless expanse of travel time ahead of us, tough choices will have to be made. We flew in and out of Madrid and had a few days in Madrid at either end of the trip. We had a great hotel, the Hotel Unico—one of those small boutique hotels we scour the internet for. And Madrid has become a food-lovers mecca. We found a branch of Astrid y Gaston, a restaurant serving Nueva Cocina Peruvian specialties that we went to when we were in Lima. Rick thought it was even better than its Peruvian cousin and very good value. We also went to a very traditional Basque inflected restaurant Zalacain. It’s been superseded by the Nueva Cocina restaurants currently garnering all the Michelin stars in Madrid these days, but in some ways I prefer it to the razzle dazzle of the hot new chefs. Zalacain was a trip back in time to the days when good restaurants were well-staffed. (Some would say over-staffed.) Instead of exhausted wait staff dashing about from table to table, the waiters were not in a pressure cooker and seemed as relaxed as the customers. It sure takes away some of the enjoyment when you are being served by overworked waiters. We had glorious weather those first few days in Madrid and we spent our first day just hanging out in the Plaza Mayor, certainly one of the most beautiful squares in Europe. We have become slow travelers, doing maybe one or two things per day. Our second day was devoted to the Prado. Of course you need a week for the Prado, but we tried to make the most of our one day. For me, one of the surprises of revisiting much loved museums is discovering how much my tastes have changed. When we were in Madrid almost three decades ago, for me, the highlight was Bosch’s “Garden of Earthly Delights.’ I remember standing there for a really long time trying to take it all in. This time, I felt no such desire—a few minutes and I was ready to move on. I’m also starting to lose my taste for El Greco, but at his stage in my life I can’t get enough Titian. 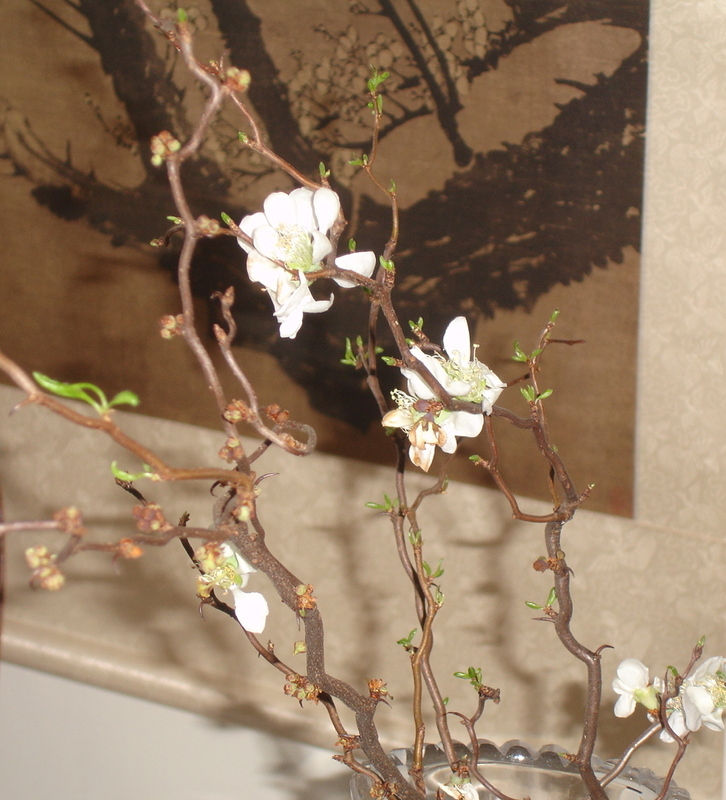 In late February and early March, my house is filled with flowers--and yes, real fragrant flowers, not the denatured kind you get in flower shops. 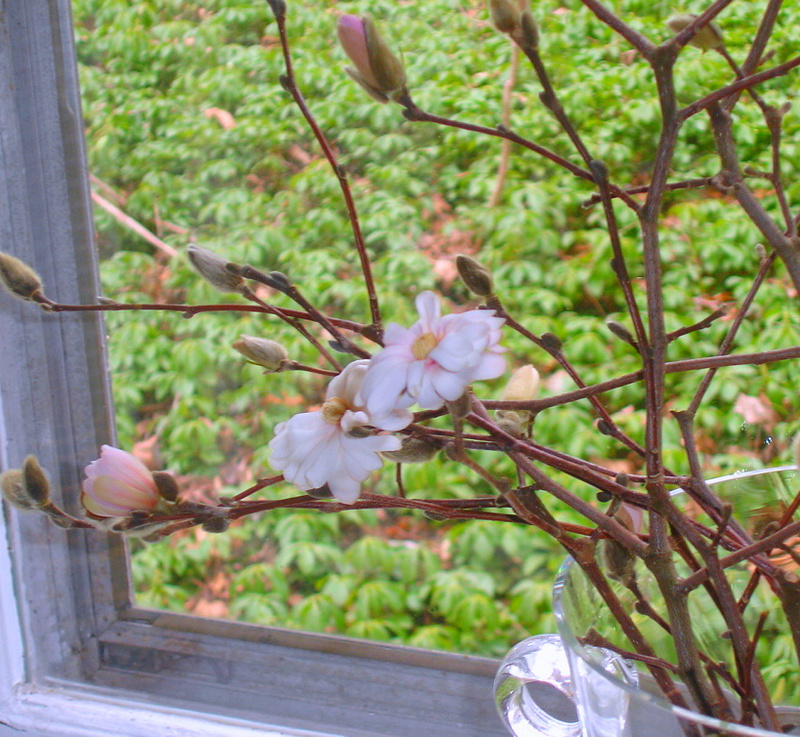 The secret is forcing bulbs and branches of flowering shrubs. In January and February I force forsythia and witch hazel. 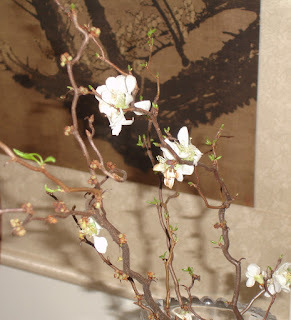 In early March, it's time for one of the easiest and most beautiful of the flowering shrubs--quince,especially quince contorta with convoluted branches almost as striking as the flowers. 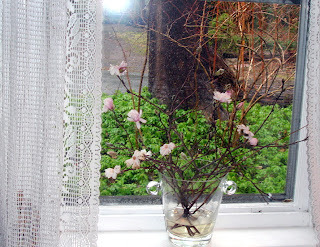 And the tremendous advantage of forcing branches of flowering shrubs is there is no advance preparation—just go out in the garden and break off a branch. Forced bulbs require a bit of forethought. 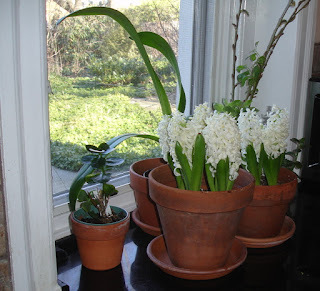 In November I put hyacinths and daffodils in pots in an old refrigerator in my basement. Hyacinths are the easiest--they need only about an 8 week chill. Tulips are the hardest usually requiring 12 weeks. 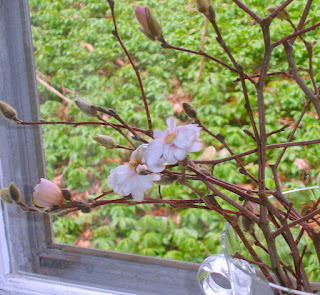 Another advantage of hyacinths is that after blooming inside, in mid-March they can be tucked in somewhere outside. 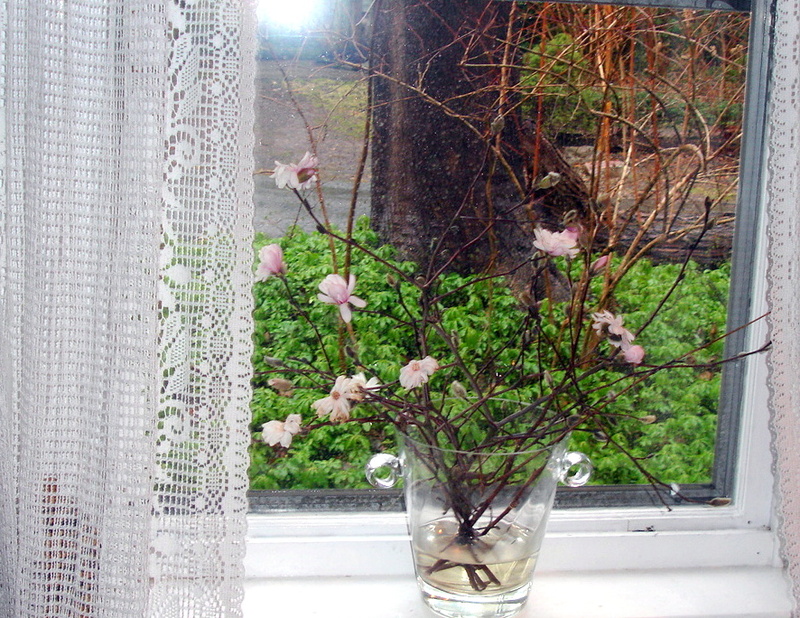 And they can be counted on to bloom the following year. Daffodils and Tulips unfortunately are not so reliable, but hyacinths are forever. And hyacinth fragrance is something I cannot get enough of.